This is timely from Kieran Healy . 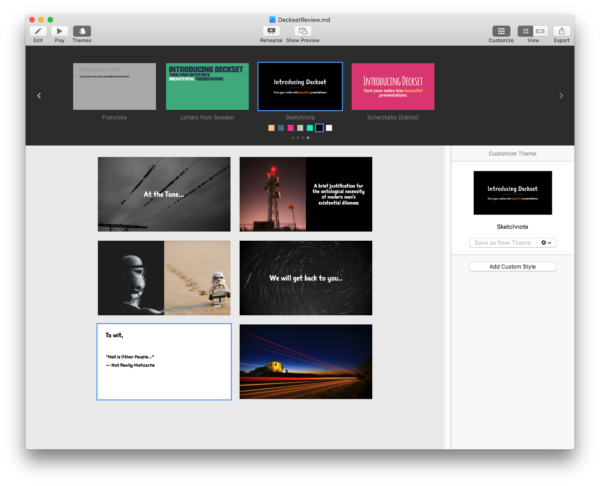 I’m just now working on a review of the wonderful Markdown slide deck app Deckset. This is as good a primer on presentation technique as I have come across. 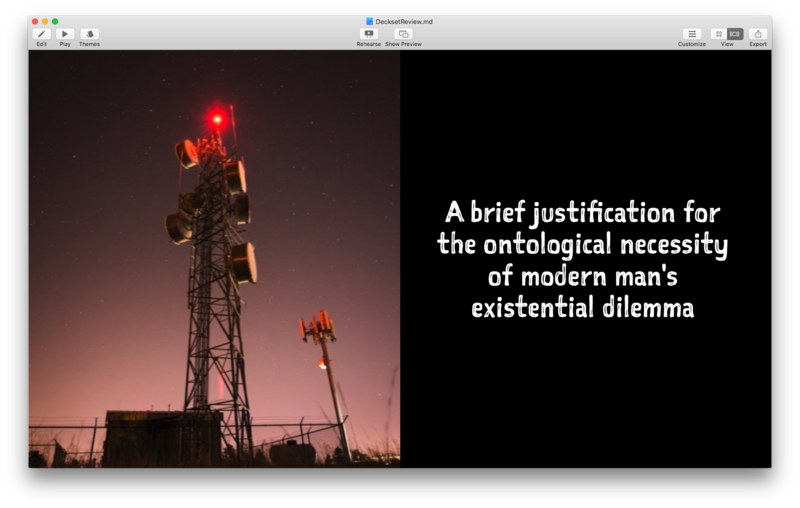 The actual slides are the most immediately visible but also the least substantively important part of your material. While I’m going to highlight a few rules and techniques about making decent slides, do not lose sight of the fact that if your paper is bad, your talk is going to be bad too. The paper is not the talk. The paper is what the talk is about. In some fields, the talk can be very closely related to the paper, and there are still people trained to “read the paper” in the old-fashioned sense. But this is increasingly rare. In most fields, especially when presenting the results of a data analysis, the presenter must condense, summarize, and highlight the important parts of their own work. The paper is the most important thing; the talk is about the paper; and you use your slides to help you give a better talk. Say Hi to Deckset 2! I’ve never enjoyed preparing slides for presentation. 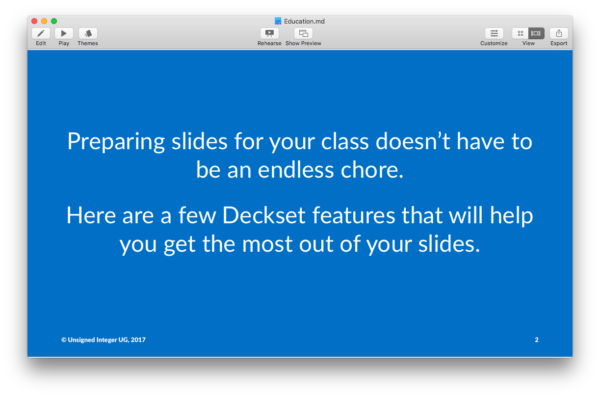 Even allowing for the improvements of Keynote over PowerPoint isn’t enough to make me enthusiastic. Deckset, however, is an all together different proposition. 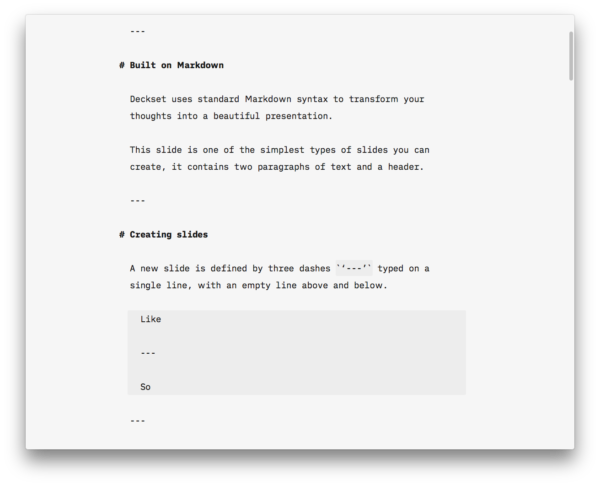 If you write in Markdown, and want to simplify your presentation workflow, trust me this is for you. The main reason for us to leave the App Store is greater flexibility in pricing. For example, we are now able to offer a 50% discount to students, teachers and other members of educational institutions. That is something we simply couldn’t do before, and we feel it’s essential to reflect the realities of how and why people use Deckset. Time willing, a full review is in the works.